Formerly English 19th-century full green morocco in a slip case; now matted. John Piggot Collection (Burlington Fine Arts Club exhibition, 1874, no. 22); Quaritch, general catalogue, 1874, no. 48; catalogue 369 (1886), no. 35777; purchased by William Morris from Quaritch in 1895; Richard Bennett (purchased from Morris's estate, 1897); Catalogue of manuscripts and early printed books from the libraries of William Morris, Richard Bennett, Bertram, fourth Earl of Ashburnham, and other sources, no. 105; purchased by J. Pierpont Morgan (1837-1913) with the Bennett Collection in 1902; J.P. Morgan (1867-1943). 1 bifolio, possibly from a ms. matricula of a confraternity of St. Leonard; illuminated in Germany in 1457. 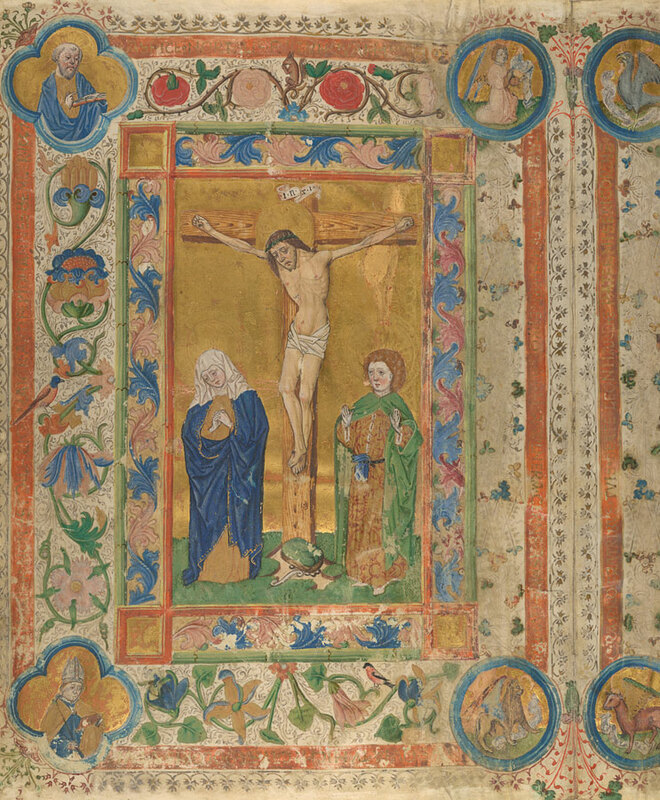 Decoration: 2 full-page miniatures, one of the Crucifixion and the other of St. Leonard. Artist: Johann Bämler; signed and dated on fol. 1: Iohannes Bemler, 1457.